We are in manufacturing and supplying of an extensive array of UV coating Machine. our product range is appreciated for its tough construction and excellent finish. 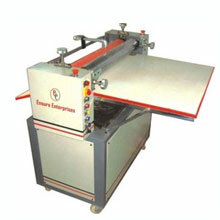 These machines are used for UV coating, paper coating, paper, board, plastic sheet, metal glass, any type of plane sheets, etc. Further, these machines are equipped with dc drive for variable speed and smooth rubber rollers for coating. Our product range is also examined on set industry standards and is obtainable at market leading prices. We are into Manufacturing and Exporting high quality Semi Automatic UV Coating Machine. These machines are used for UV coating, paper coating, paper, board, plastic sheet, metal glass, any type of plane sheets, etc. Size available : 15", 20", 25", 30", 36" and 40".